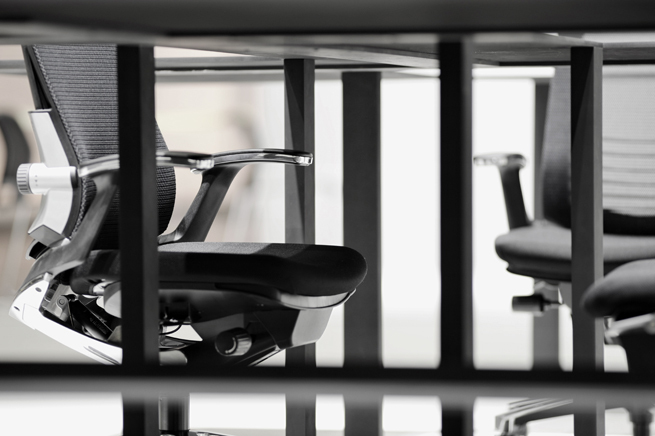 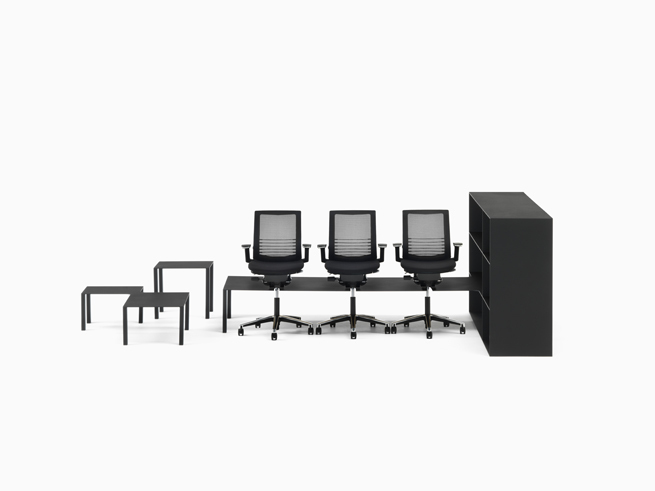 While our demands on office space become only more and more diverse, office furniture has not changed along with these demands and remains oddly standardised. 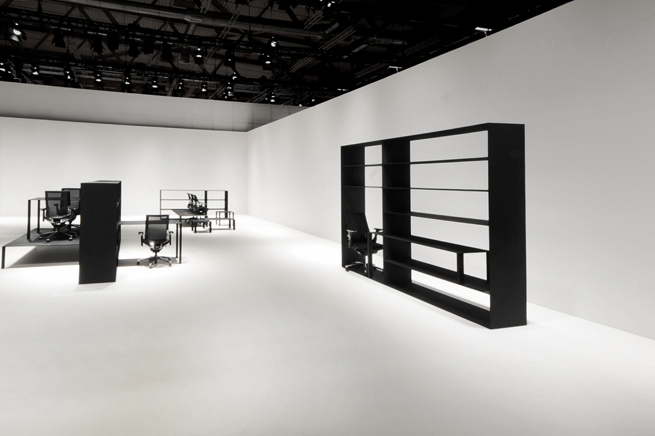 In contrast, our installation tried to capture the spirit of Kokuyo Furniture by returning to the fundamental principles of the office and asking what, ultimately, an office is. 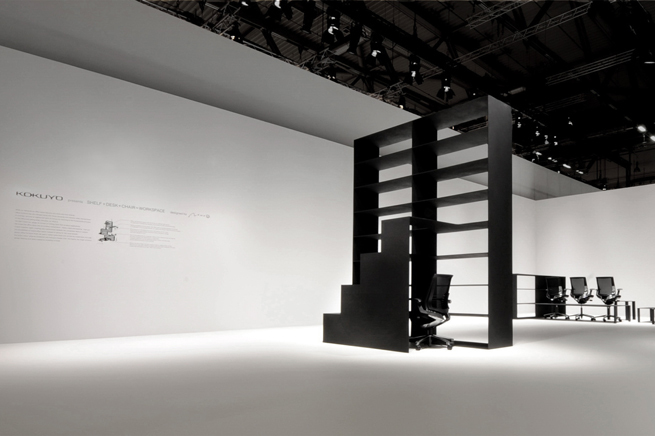 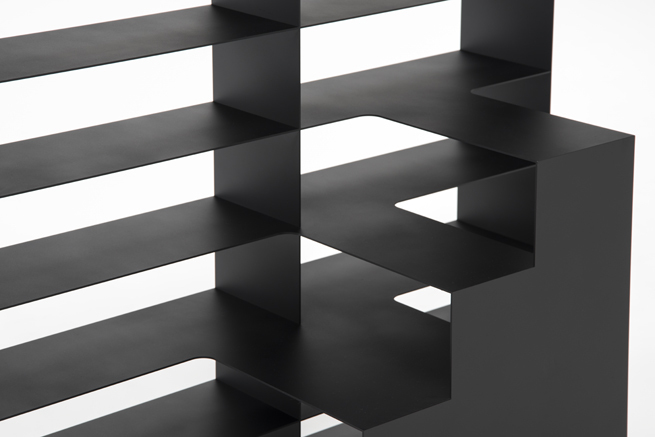 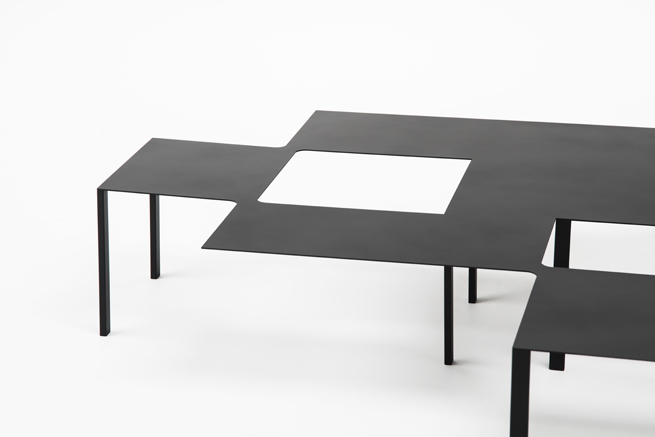 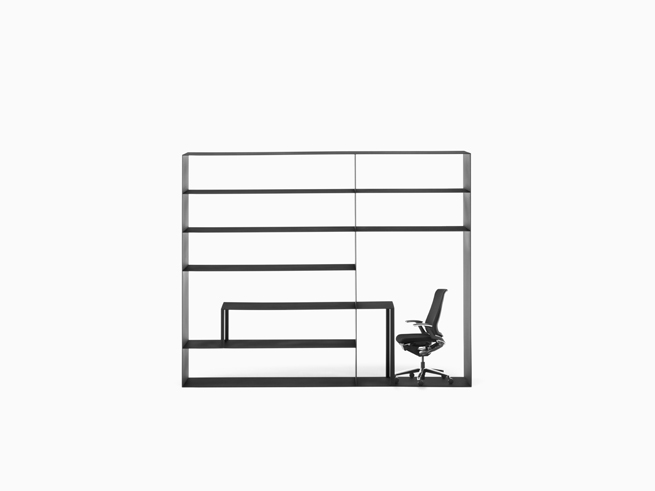 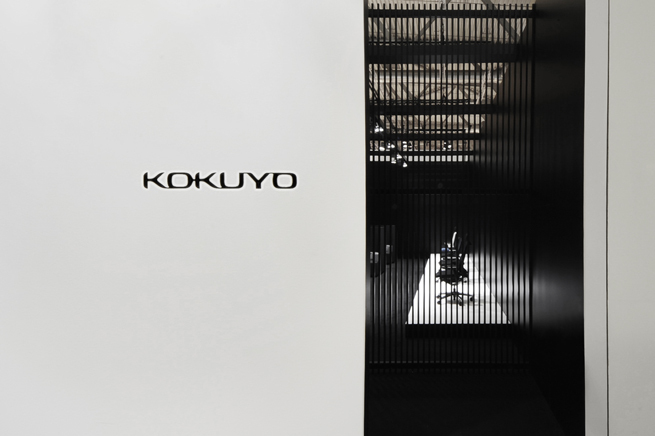 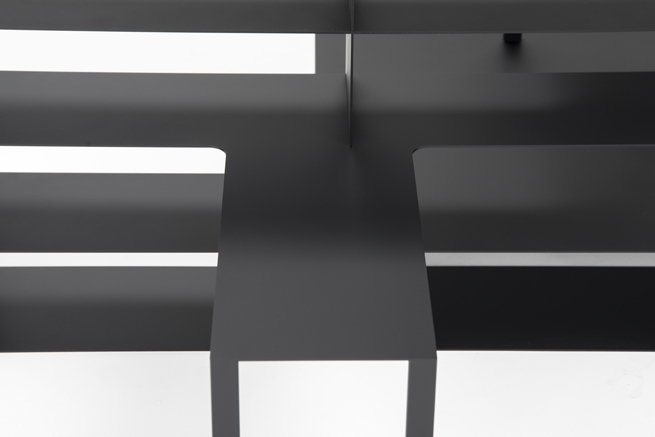 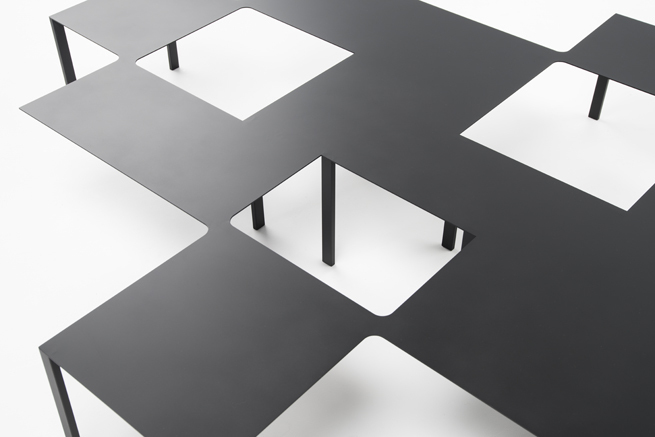 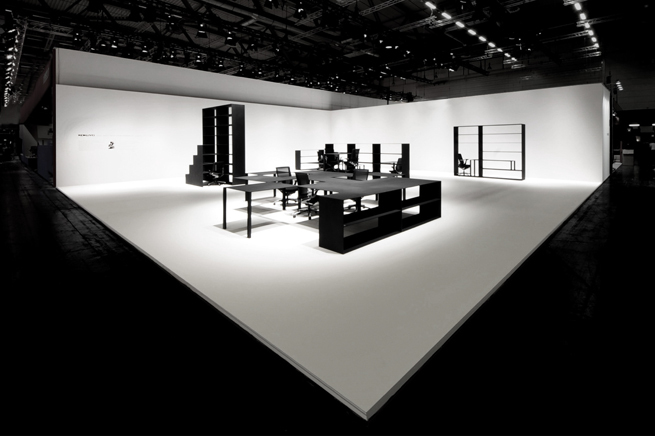 For Orgatec 2014, we didn’t want Kokuyo’s exhibition to consist of nothing more than product explanations. 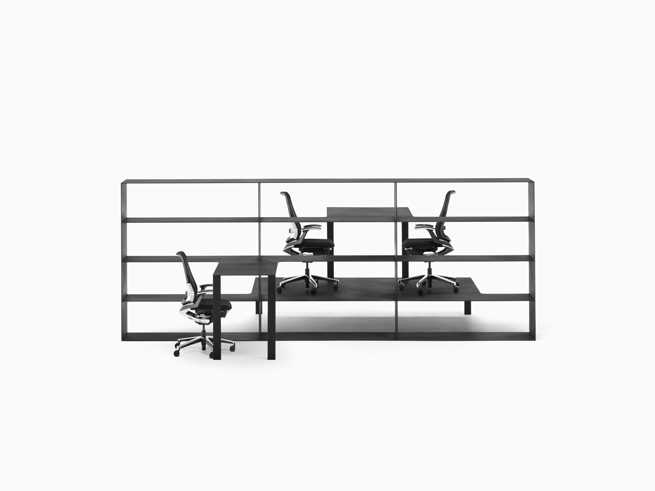 We broke the office down into its smallest components – desks, chairs and shelving – then put it back together again, creating new relationships between the component items to explore the possibilities of future office space. 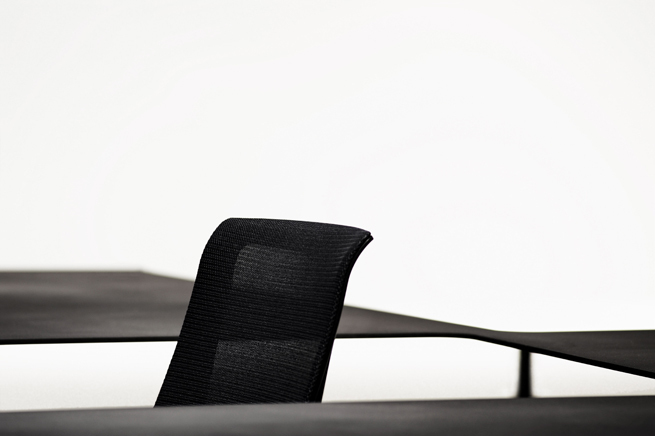 Instead of opting for the usual smooth, glossy office furniture finish, we used a varied matte finish and carried the muted black through the entire colour scheme. 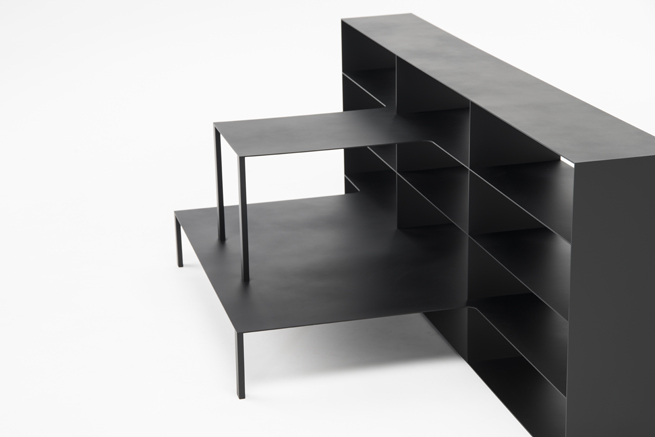 Combined with Kokuyo’s newest chair, the Inspine, the rough, primitive design shelving and table created an arresting contrast. 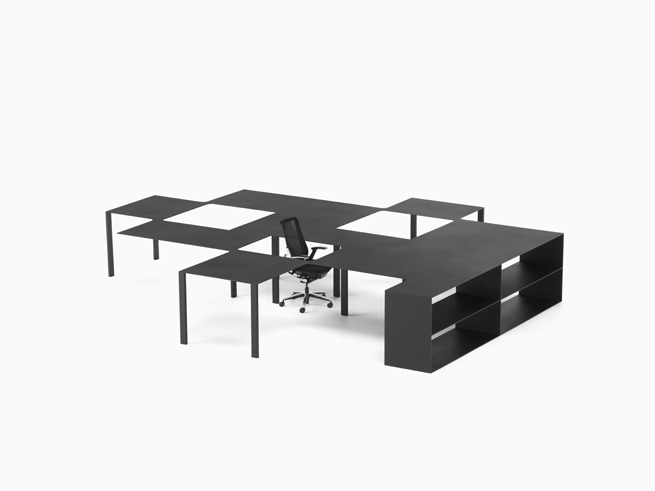 Removing some of the shelves turns part of the shelving unit into a desk. 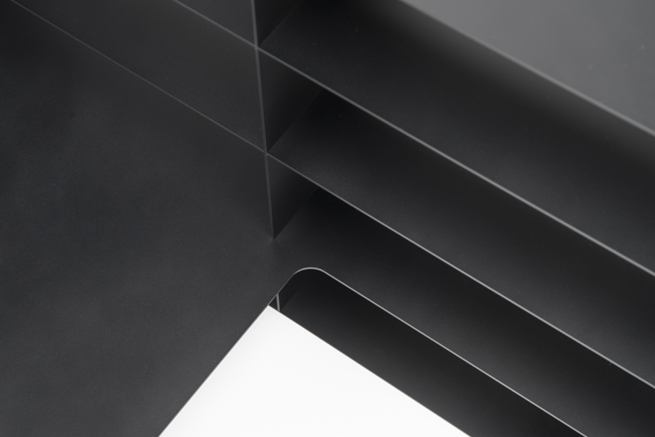 Exploring the boundary between horizontal surfaces intended for storage, and those intended for work. 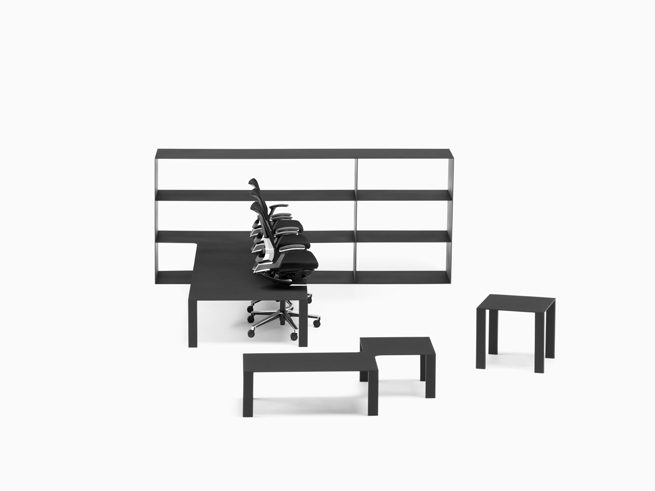 Desks and floorspace appear when the shelves are scattered right and left. 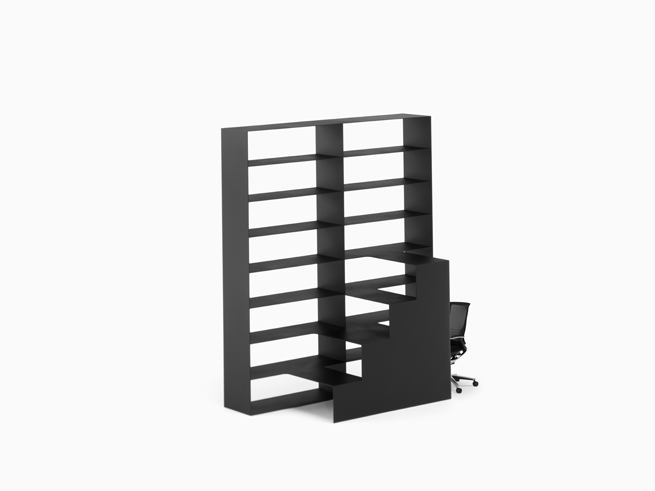 An experiment in transforming shelving’s vertical levels into office three-dimensionality. 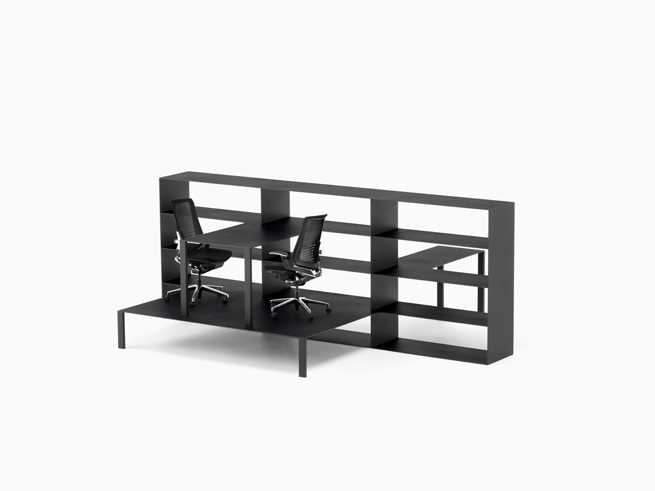 Shelves and desks mingle, and space appears inside by cutting out their overlaps. 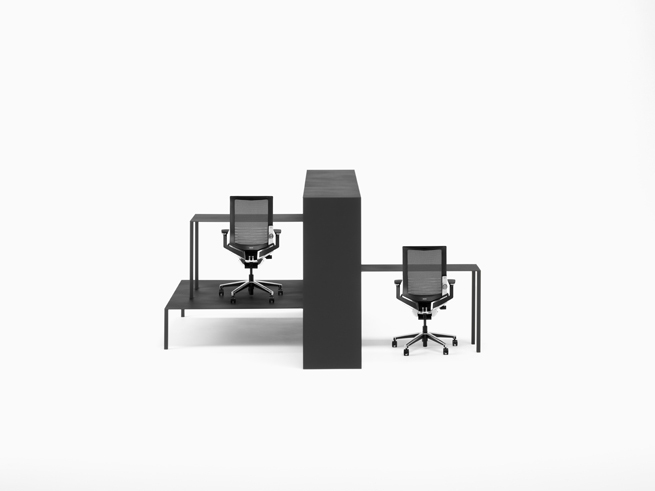 Searching for a new way of gathering together and a new spatial relationship with desks, in which we’re enclosed by our desk, rather than sit facing it. 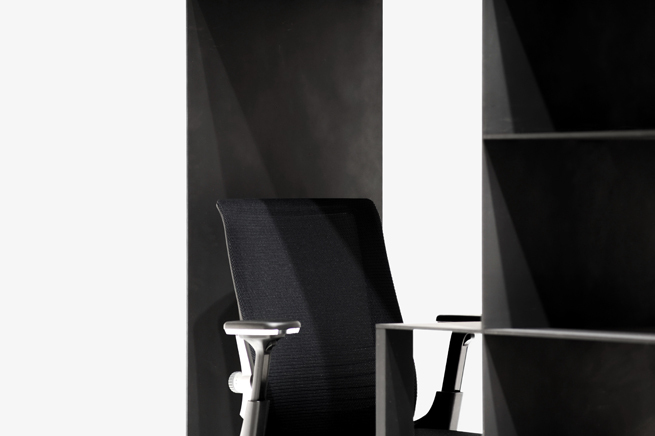 Resting and waiting functions appear when office chairs are partially absorbed into the shelf. 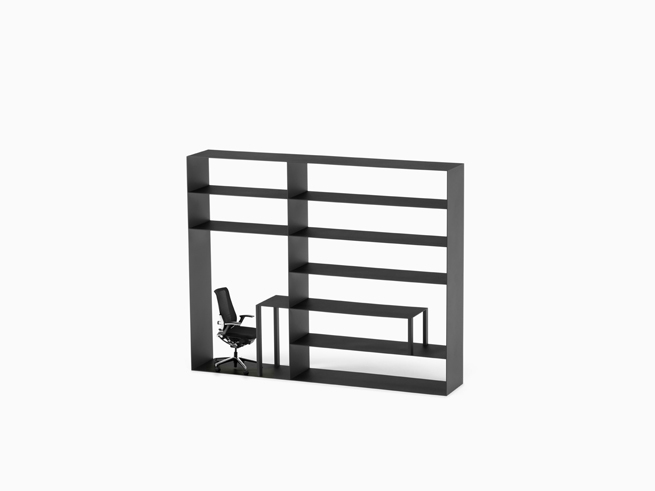 A consideration of the boundary between ‘on-‘ (office) and ‘off-duty’ (lobby and amenity) furniture. 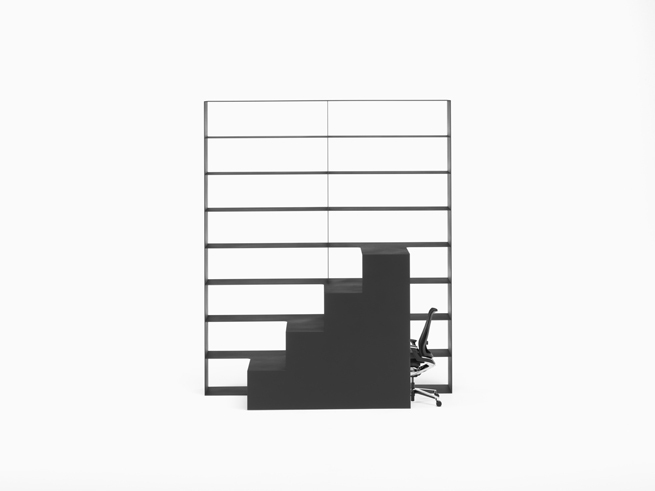 Some of the shelves become a staircase. 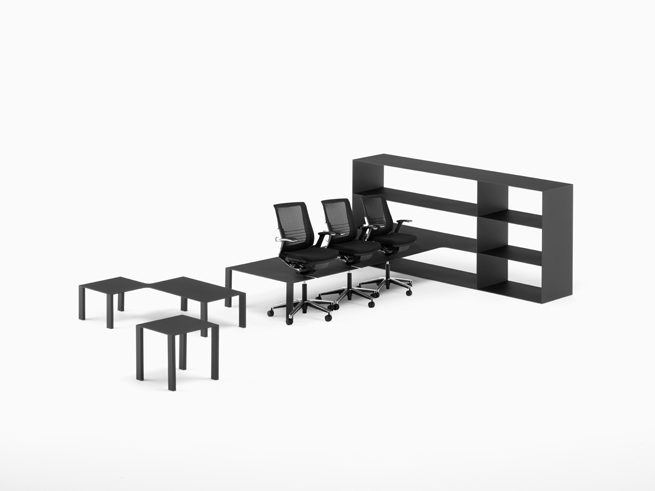 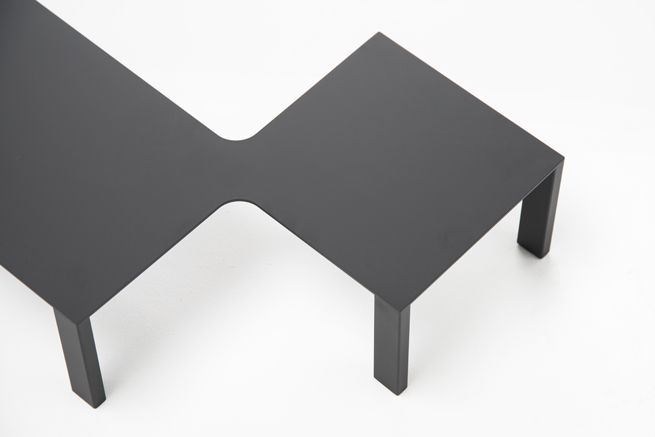 Sitting on them transforms them into benches, and when accessed from behind they’re a closed desk. 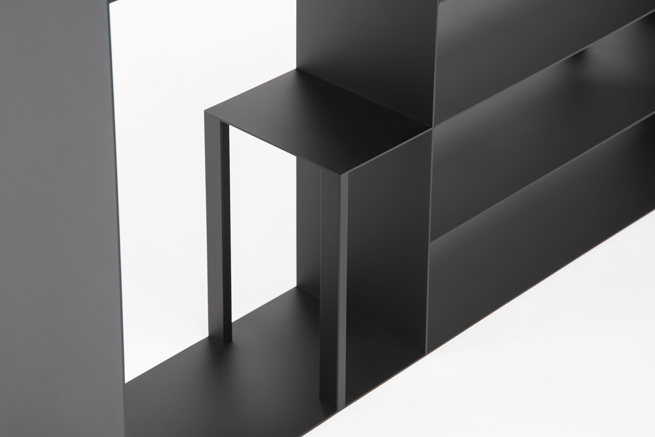 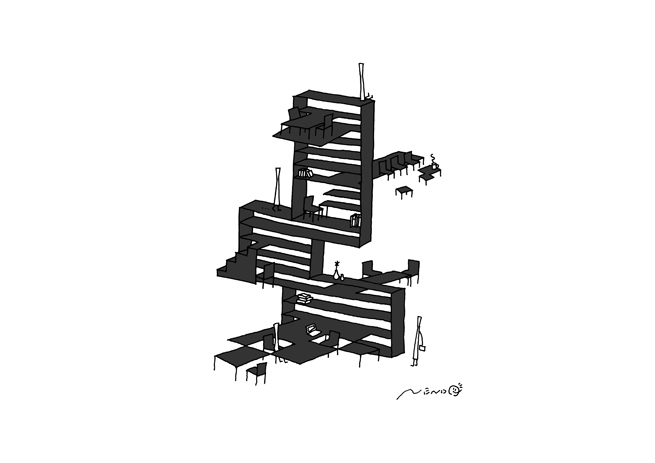 A thought experiment into the relationship between dynamic and static space, and the different functions of front and back.